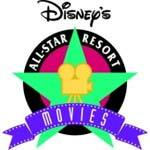 Disney's All Star Movies Resort is a Disney Value Resort hotel featuring giant icons that salute classic Disney films—including Disney·Pixar's Toy Story, Fantasia, The Love Bug, The Mighty Ducks and One Hundred and One Dalmatians. Guest rooms are divided into 5 pairs of 3 story buildings—each pair themed after one of the featured movies. For example, the Toy Story section features a 27-foot-tall bucket of Green Army Men, a 30 foot-tall Woody icon and a 47 foot-tall Buzz Lightyear icon. The buildings are painted in bright colors and covered with playful details and hidden surprises.